Mr. George Steward has been a featured soloist with Everett Philharmonic, Eastside Symphony, Mukilteo Community Orchestra, Philharmonia Northwest, Octava Chamber Orchestra, Skagit Symphony, Sammamish Symphony, Northwest Wind Symphony, Everett Symphony, Cascade Symphony, Brass Band Northwest, Boeing Employees Concert Band, and KING-FM. He has also soloed with a number of other ensembles, including Wheaton Summer Symphony (IL), Central Connecticut State University Chamber Orchestra, and Clinton Symphony (IA). Mr. Steward is currently principal trumpet with Everett Philharmonic, Cascade Symphony, and Octava Chamber Orchestra, and is a member of Lake Washington Symphony. He was formerly principal trumpet in Elmhurst Symphony (IL), New Philharmonic Orchestra (IL) and Evergreen City Ballet Orchestra, and was assistant principal in Elgin Symphony (IL), Eastern Connecticut Symphony, and Bellevue Philharmonic. Mr. Steward earned a Bachelor of Music at Wheaton Conservatory of Music and a Master of Music at Yale School of Music. He has studied trumpet with Terry Schwartz at Wheaton, Ross Beacraft of Chicago Brass Quintet, William Scarlett of Chicago Symphony, and Robert Nagel of New York Brass Quintet and trumpet professor at Yale. Mr. Steward teaches trumpet at his studio in Lynnwood. Ms. Yuka Sasaki has garnered glowing concert reviews and top prizes competitions from the U.S. and abroad. She began playing piano at age 5 in Johannesburg, South Africa before moving back to her native Japan, where her teachers included the renowned Kazuko Yasukawa and Henriette Puig-Roget at the world famous Toho Gakuen School of Music (Tokyo), where she earned her Bachelor of Music in Piano Performance. While living in Japan, Ms. Sasaki won the NHK Debut Award in Tokyo. She later pursued her graduate studies with the legendary Bela Siki at the University of Washington where she received both her Master of Music and Doctor of Musical Arts degrees in piano performance. During this time she was awarded the Mortar Board Alumnae and Brechemin Scholarships, as well as the Ladies Musical Club of Washington Scholarship. Ms. Sasaki continued her studies with such esteemed pianists as Randolph Hokanson in Seattle and Seymour Bernstein in New York. First Prize winner of the Northwest Young Artist Piano Competition, Ms. Sasaki has also won top prizes at the Trani International Piano Competition (Italy), the Nena Plant-Widerman Piano Competition (Louisiana), as well as First Prize in both the Bushell and the Ladies Musical Club competitions (Seattle). Ms. Sasaki has concertized extensively including recitals at the Teatro Civico and Domenico Sarro in Italy, the Piccolo Mondo International Music Festival in Switzerland, and in Japan at the Yokohama Kenmin Hall, OJI Hall, and Tokyo's prestigious Suntory Hall, where she received praise as possessing a "…virtuosic technique, fantastic musical temperament with a beautiful sound" (Ongakuno Tomo magazine, Japan). As a concerto soloist, her appearances include performances with the Okazaki Symphony, Northwest Symphony Orchestra, Seattle Philharmonic and the University of Washington Orchestra. A dedicated music educator, Yuka Sasaki performs recitals to broaden the classical music audience of all ages at such venues as the Frye Art Museum, the Seattle Art Museum and Seattle Asian Art Museum on behalf of the Seattle Music Teachers Association. Currently on the music faculty at Seattle Central Community College, she also maintains a private studio in Bellevue from which her students have won numerous awards, and to some of the world's foremost music schools and conservatories. Ms. Victoria Parker has been featured both as soloist with numerous orchestras across the US, including the Vermont Mozart Festival Orchestra, One World Symphony, Kalamazoo Symphony, and Lake Washington Symphony. Ms. Parker is a co-founder and leader of the conductor-less chamber orchestra, NOCCO. She performs frequently with the Seattle Symphony and Seattle Opera and can be heard on many popular albums and motion picture soundtracks. Ms. Parker is also a resident violinist at the House Of Breaking Glass recording studio in Seattle. Her love for collaboration and interest in interdisciplinary arts helped launch NOCCO, Gossamer Collective, Parker Duo, Trio Pardalote, and Helix Series, and continues to shape many of the projects in which she is involved. Ms. Parker received a Bachelor of Music degree from Western Michigan University and a Master of Music degree from Manhattan School of Music. She lives in Seattle with her husband, Robert, and their son, Oliver, and daughter, Loretta. Soprano Christina Kowalski is known for the unique dark timbre of her voice, her “glowing heights and warm depths” that excite audiences in the U.S.A. as well as in Europe. She is a native of Germany, where she graduated with a Masters in Music and Drama from the Hochschule für Musik und Kunst in Frankfurt am Main. Ms. Kowalski has appeared with the Frankfurt Opera Studio as the Governess in Turn of the Screw and Parascha in Stravinsky’s Mavra. Ms. Kowalski toured with “Febi Armonici” and Maestro Michael Schneider throughout Germany and appeared as Amore in “Poppea” at the Stadttheater Eisenach and the Berlin Philharmonic. Christina Kowalski, a native of Germany, joined faculty at the University of Puget Sound in 2005. A graduate in music and drama from the Hochschule für Musik in Frankfurt, Ms. Kowalski has been active in opera and concert music in both Europe and the United States. She has appeared in productions by the Frankfurt Opera Studio, Stadt-Theater Schiffenberg in Giessen, Orchester Gesellschaft in Frankfurt, and the Stadttheater in Eisenach. She performed an all-Schubert program by invitation of the Viennese Society for Young and Promising Talent, and in Frankfurt she was a member of the Lied-Klasse (master class series on German song) of Professor Charles Spencer, accompanist for Jessie Norman. In the United States Ms. Kowalski made her debut as Marzelline in Beethoven’s Fidelio at the Mark Theater in Portland. She has been in five productions with the Portland Opera and has performed in the Portland Summer Fest as well as Opera Coeur d’Alene. Her diverse repertoire includes roles in full productions of operas by Monteverdi, Beethoven, Puccini, Mozart, Verdi, Donizetti, Stravinsky, Britten, and Menotti. Her concert performances have included engagements with Berliner Symphonie and the Bravo! Vancouver Orchestra in such repertoire as Beethoven’s Ninth Symphony, Bach’s Magnificat, and Bach Cantatas 51 and 140. In both 2001 and 2002 she took first prize in the Oregon District of the Metropolitan Opera National Council Auditions. Violinist Brittany Boulding has appeared as soloist with the Northwest Sinfonietta, Auburn Symphony Orchestra, Pacific Northwest Ballet Orchestra, Cascade Symphony Orchestra, New Haven Symphony Orchestra, Spoleto USA, National Repertory Orchestra and the Orquesta de Camara Concierto Sur (Cuba). She has also performed recitals across the United States and internationally. Her major music festival appearances include Tanglewood, Spoleto, Aspen, Vail, Banff and Bellingham. A passionate chamber musician, she is a member of the Finisterra Trio, and can be seen performing at chamber festivals such as the Methow Valley, Simple Measures, Second City, Seasons, Russian Chamber Music Foundation, Guemes Island, Vashon, Bainbridge, Auburn, Cornish, Jacobsen and New Lens Series. Ms. Boulding is Concertmaster of the Northwest Sinfonietta and the Auburn Symphony as well as Associate Concertmaster of the Pacific Northwest Ballet. She also performs regularly with the Seattle Symphony and the Seattle Opera. Ms. Boulding earned her Bachelor of Music from Rice University and her Professional Studies Certificate from the Colburn Conservatory under the tutelage of Robert Lipsett. A Pacific Northwest native, Ms. Boulding grew up performing and recording with her family, the internationally acclaimed Magical Strings. Brittany enjoys spending her free time hiking, running and doing yoga with her dogs Wotan and Capote. Clarinetist Sean Osborn has performed on four continents since his recital debut at the age of seventeen at the Kennedy Center for the Performing Arts. Appointed over nearly 300 other applicants to a position with the Metropolitan Opera Orchestra in 1989, Mr. Osborn was the youngest clarinetist in the history of the Met. He has also performed as guest Principal Clarinet with the New York Philharmonic, Pittsburgh Symphony, Seattle Symphony , and the American Symphony Orchestra. Sean is a top prize winner in both the ARTS Competition and the International Clarinet Society Competition, and in 1984 was named a Presidential Scholar in the Arts. He has also participated such festivals as Marlboro, Seattle Chamber Music, Zagreb Biennale, Pacific Rims, Colorado, and Aspen, as well as recording for Sony Classics, London, Deutsche Grammaphon, CRI, and others. A frequent chamber musician, Mr. Osborn has collaborated with many world-class musicians, including James Levine, Donald Weilerstein, Richard Stoltzman, Jeremy Denk, Adam Nieman, Milan Turkovic, members of the Tokyo, Colorado, and St. Lawrance String Quartets, and members of the orchestras of New York, Philadelphia, San Francisco, Cleveland, Los Angeles, Pittsburgh, Boston, and others. Also a new music specialist, Sean has presented premiers of many composers, including John Corigliano, John Harbison, Phillip Glass, John Adams, Michael Daugherty, Chen Yi, Jennifer Higdon, and Chinary Ung. A student of Stanley Hasty at the Eastman School of Music, Mr. Osborn is a graduate of the Curtis Institute of Music and the Interlochen Arts Academy where received its highest honor - the Young Artist Certificate, while studying with Dr. Frank Kowalsky. In 1999 he received his Master's Degree from Southern Illinois University, where he studied clarinet with Dr. Eric Mandat and composition with Dr. Frank Stemper. He has also given numerous master classes throughout the country, including those at The Eastman School of Music, Rice University, Florida State University, and The Manhattan School of Music. 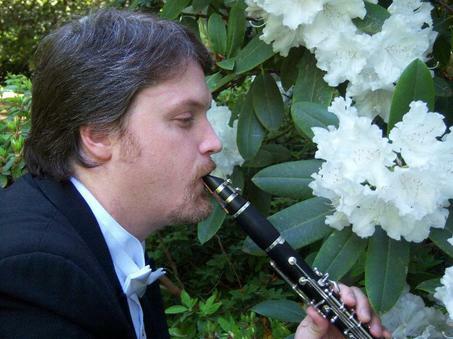 From 2006-2009, Sean taught clarinet and chamber music at the University of Washington.